286 pages | 190 B/W Illus. Images from CT, MRI, PET, and other medical instrumentation have become central to the radiotherapy process in the past two decades, thus requiring medical physicists, clinicians, dosimetrists, radiation therapists, and trainees to integrate and segment these images efficiently and accurately in a clinical environment. Image Processing in Radiation Therapy presents an up-to-date, detailed treatment of techniques and algorithms for the registration, segmentation, reconstruction, and evaluation of imaging data. It describes how these tools are used in radiation planning, treatment delivery, and outcomes assessment. The book spans deformable registration, segmentation, and image reconstruction and shows how to incorporate these practices in radiation therapy. The first section explores image processing in adaptive radiotherapy, online monitoring and tracking, dose accumulation, and accuracy assessment. The second section describes the mathematical approach to deformable registration. The book presents similarity metrics used for registration techniques, discussing their effectiveness and applicability in radiation therapy. It also evaluates parametric and nonparametric image registration techniques and their applications in radiation therapy processes. The third section assesses the efficiency, robustness, and breadth of application of image segmentation approaches, including atlas-based, level set, and registration-based techniques. The fourth section focuses on advanced imaging techniques for radiotherapy, such as 3D image reconstruction and image registration using a graphics processor unit. With contributions from an international group of renowned authors, this book provides a comprehensive description of image segmentation and registration, in-room imaging, and advanced reconstruction techniques. Through many practical examples, it illustrates the clinical rationale and implementation of the techniques. 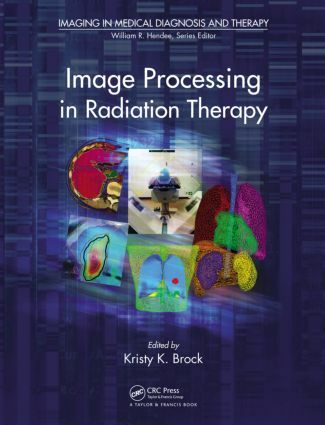 "As no dedicated course on image processing for radiation therapy typically exists, this book may very well help build the foundation for future educational initiatives in this important bridging area. One could imagine a future version of this book containing problems to allow students to exercise the knowledge they've gained." Kristy K. Brock is an associate professor in the Department of Radiation Oncology at the University of Michigan, where she received her Ph.D. in nuclear engineering and radiological sciences. She is a board member of the American Association of Physicists in Medicine (AAPM), the therapy science director for the 2013 AAPM 2013 annual meeting, an editorial board member of Medical Physics, and a diplomat in therapeutic radiological physics of the American Board of Radiology. Her research focuses on deformable registration for dose accumulation and adaptive radiotherapy, the application of biomechanical modeling in correlative pathology, and therapy response assessment.